This little village on the north-east corner of the Dzongkhag is as sleepy as all other villages in the country. Made up of quaint two or three-story houses of rammed mud and wood, sitting in the midst of agricultural land, life seems as old as time. It is a typical place where you can be away from the everyday too-busy-to-relax city life. On the north-eastern side you can see the mountains that separate Haa from the Tibetan region of Chumbi valley. Rugged as the region is, the people also evoke the same feelings, with their own typical lifestyle, part of the overall Bhutanese milieu, yet different and unique. It has about 60 households, with a population of about 200 people. If ‘isolationism’ can be used as a term to describe the village and the people, it cannot be far from the truth. Yet it cannot be denied that it is part of the Bhutanese landscape. And that is the beauty. Soednam Zingkha is a guest house with a difference. Having considered all these issues, a bold step was taken to construct a tourist lodge in Hatey village in Bji Gewog to reverse this prevailing trend in the tourism market, and to ensure that Haa also benefits from tourism. Converted from the traditional old house without changes in the original superstructure, it is set against a backdrop of evergreen pine trees, below the shadows of snow-capped mountains, Soednam Zingkha is your typical three-storied Bhutanese house sitting on two-acre land, surrounded by Hatey village. The general appearance of the lodge evokes century-old traditional architecture, blending into the setting of a rural village effortlessly, ensuring a cultural unity with the past and the present. The name suggests the surface of the pond (zingkha) on which the jewel of luck (Soednam) rests. Historically too, the house was known as ‘Zingkha,’ considered a rich household and the lady of the house was known as ‘ZingkhaMii-aum,’ the mother of the community. 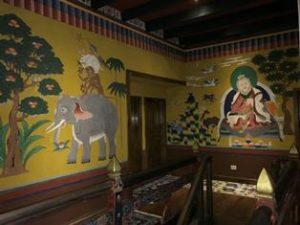 Inside, it is fitted with the latest modern amenities for the comfort of the international guests, while the décor is exquisitely Bhutanese with traditional wall paintings. The fifteen-room lodge has deluxe suites of international tourist standards. There are also separate rooms that serve as reception / lounge area and a dining room that can accommodate more than 25 people. To reach it, you just take a small road off the main street after crossing a huge concrete bridge (YakChhu Zam) at Hatey village. It is almost 8 kilometers drive from the main Haa Town. You will reach a car park after a little drive down the small road. You are here, now you walk around the old Chorten (Stupa) next to the stream and there you are met by the staff members who will lead you up a flight of stairs into the lounge where you are served the ‘welcome tea’ including beverages to relax after a tiring journey. From there, you will be accompanied to your individual room. As you walk into the main building and up the wooden stairs, the first person who welcomes you is an old man with religious beads in his hand sitting next to a tree. The painting is known as ‘Tshering Dru-Kor’ six symbols of long life. The tree symbolizes an abundance of nature, the rock is the earth, birds and animals signify an abundance of livestock (wealth) and the waves, the water and the air above it. In fact the whole painting depicts elements that contribute to long life. You can observe the symbols of cooperation and friendship as in the Thuenpa Puenzhi painting and the taming of the tiger that looks simplistic but the symbolism indicates protection of Buddhism from negative influence or other obstacles. On the right of the rooms, on the north-east direction is situated the Choesham (the altar room), where you can meditate and offer your prayers. The walls are decorated with “Gueri” designs used as wall decorations found only in old temples and palaces, according to tradition. The name comes from the circular patterns or curlicues in ancient Chinese silk cloth. While the rooms have internet connections, the rooms do not have TV sets. The TV has not been installed in the rooms because we expect that our guests would not like to be disturbed with everyday happenings ensuring complete detachment from the worries of the world. In case if you still feel the need, then our lounge area has one accessible. They can also watch documentaries on Haa and Bhutan. Few bedrooms have attached bathrooms for the old and infirm or those with children. Others will have to use the bathrooms in the hall way but on the same floor. According to our tradition, toilets constitute a source from where ailments emanate (dips). That is why traditionally bathrooms are located outside house. 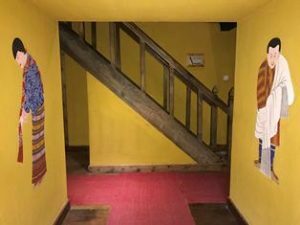 The lodge serves set menus, including local Bhutanese dishes acceptable to international clientele but Haap specialties such as Hoentey, Khuli and Akho, can be served on request. The lodge is also ideal for conferences, brainstorming sessions and annual retreats for staff members of government departments. For guests who would like to drink something to keep them happy and warm in the evening, they have a choice of international, regional and national beverages, including the ‘Ara’ distilled from fermented wheat, maize or millet, and ‘Bangchang’, fermented wheat or corn juice.